Almon Andrew Gray was a pioneer in aeronautical communications. After graduating from the George Stevens Academy in 1928 and the Massachusetts Radio Telegraph School in 1930, he enlisted in the Navy, where he was a radioman and gunner aboard cruiser based aircraft. He also learned to fly. Upon expiration of his enlistment he signed on with Pan American Airways, and in 1935 helped build the bases to support the first trans-Pacific air service and was first officer-in-charge of the PAA radio station on Wake Island. After the San Francisco-Hong Kong air route was opened in late 1935, he was a radio officer in the China Clipper and her sister flying boats. 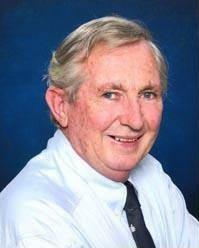 Later he was assistant superintendent of communications for PAA’s Pacific Division. 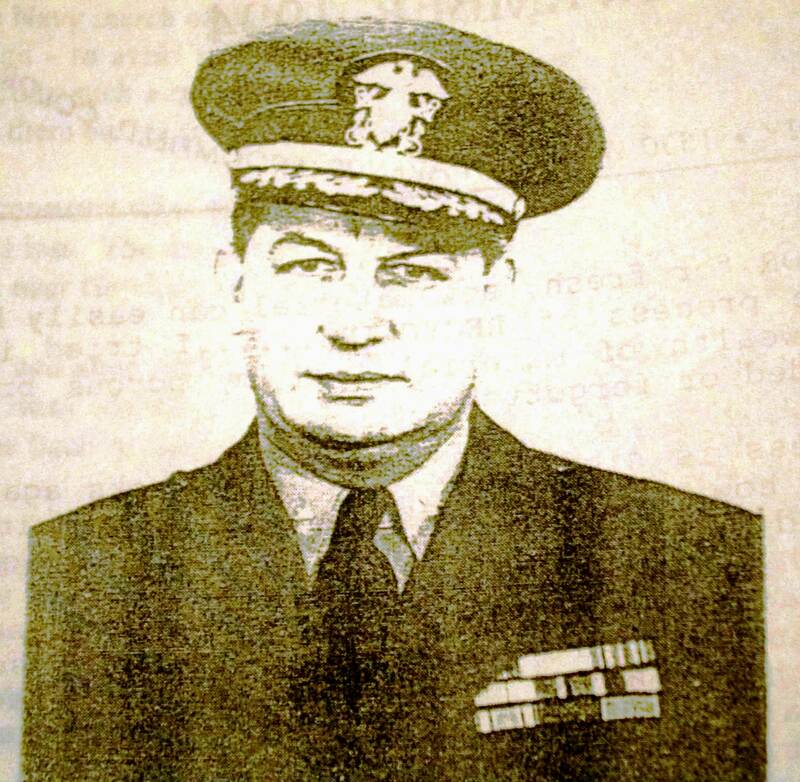 Gray was also a Navy Reserve captain, flew with Fred Noonan in the 1930s and was an important figure in the development of the Marshall Islands landing scenario. He died at 84 on Sept. 26, 1994 at Blue Hill Maine. 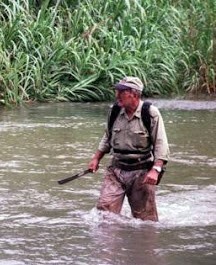 In coming weeks and months, some of Gray’s writings will be featured on this blog. Capt. Almon Gray, USNR, wrote extensively on Amelia Earhart’s radio problems during her last flight. More than anyone in Earhart research history, with the possible exception of Paul Rafford Jr., Almon Gray was qualified to discuss Amelia Earhart’s radio arrangements and behavior. “Amelia Earhart and Radio” first appeared in the June 1993 issue of Bill Prymak’s Amelia Earhart Society Newsletters. From the outset, readers should understand that in this analysis, Gray assumes that Earhart was actually trying to reach Howland island, and that she was attempting to establish two-way communication with Itasca, which never happened. In his piece, Gray also doesn’t try to explain why she was never on the air for more than 10 seconds, something that has led many to speculate that Earhart didn’t want her position to be known and that something else was afoot besides her official flight plan. Most of that written about the disappearance of Amelia Earhart while on an around-the-world flight in 1937 attributes her failure to reach Howland Island to unstated deficiencies related to radio. It appears however that very little has been written about the nature of those deficiencies, or how they came about. What follows will attempt to fill that gap and show what errors in planning and execution were made in respect to radio; what failure or malfunctioning of radio equipment occurred and the probable reason for it; and will point out the single item or event deemed most directly responsible for the failure of the plane to reach Howland Island. Since 1937 the unit of measurement for radio frequencies had been changed from “cycles” to “hertz” (Hz), consequently kilocycles (Kc) and kilohertz (kHz) will be used interchangeably, as will megacycles (Mc) and megahertz (MHz). It is assumed that the reader already is familiar with the general history of the flight. 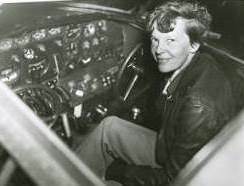 In early 1937, several weeks before her Oakland-Honolulu flight, and while she still intended to circumnavigate the world in a westerly direction, Miss Earhart met at Alameda, Calif., with George Angus, the superintendent of communications for the Pacific Division of Pan American Airways. Angus was responsible for the radio communication and radio direction finding networks which supported the PAA clippers on their trans-Pacific crossings, and Miss Earhart wished to arrange for help from those facilities during her planned flight. She was particularly interested in obtaining radio bearings to augment her celestial navigation. At that time PAA had specially designed versions of the Adcock radio direction finding system in service at Alameda; Mokapu Point, Hawaii; Midway Island; Wake Island; Guam; and Manila, Philippines to support Clipper operations. These systems were capable of taking radio bearings on frequencies much higher than could be utilized successfully by conventional loop-type direction finders, hence were effective over much greater distances. They were commonly referred to as “high frequency DFs,” and were the only ones of that type in the United States and its territories. Angus agreed to help Earhart while she was within radio range of PAA stations, and details for so doing were worked out. This was somewhat complicated inasmuch as PAA was not equipped to transmit on either of Earhart’s communication frequencies (3105 kHz and 6210 kHz.) and could not transmit voice on any frequency. The solution agreed upon was that the plane would request a bearing by voice on the frequency in use, (usually 3105 kHz at night, 6210 kHz during the day) and follow the request with a series of long dashes lasting in the aggregate a couple of minutes. The PAA DF station would take a bearing and transmit it to the plane on a previously agreed upon PAA frequency, using “CW” (telegraphy) sent at such a slow speed that the individual dots and dashes of the numbers could be copied on paper and later translated into numbers. This arrangement was tested on the flight from Oakland to Honolulu with the bearings being taken by PAA on 3105 kHz and sent to the plane on 2986 kHz It worked out very well. The Bendix RA-1B, used in Amelia Earhart’s Electra during her final flight without apparent success, was a brand new product and was reputed to be pushing the state of the art in aircraft receiver design. The Oakland-Honolulu flight was uneventful, and from the standpoint of radio was handled much the same as a Clipper flight. 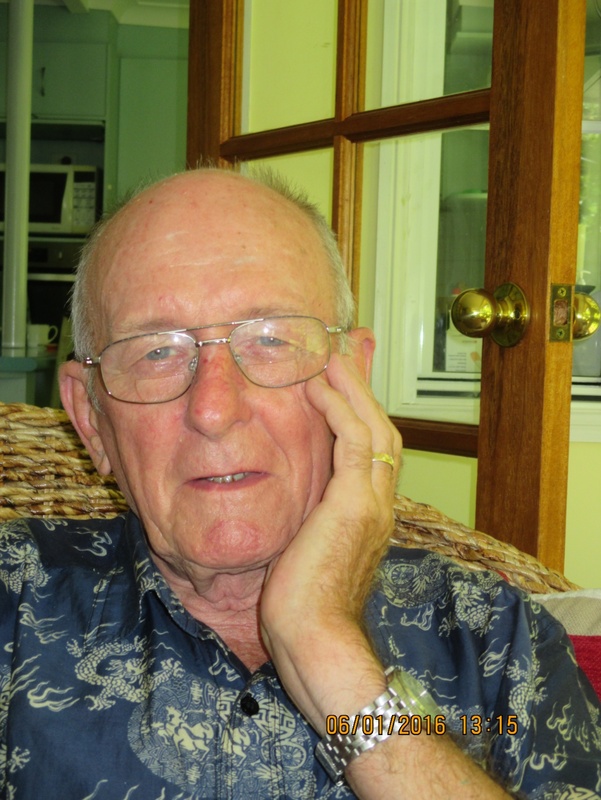 Captain Harry Manning, an experienced radio operator, handled the Electra’s radio and DF gear while the ground radio facilities were operated by the regular PAA professional radio operators. Radio bearings were furnished the plane at frequent intervals, first from Alameda and later from Mokapu Point. They checked well with the positions Noonan determined by celestial navigation. As the plane neared Oahu, Manning set up the plane’s direction finder to home on the Marine Radio Beacon (290 kHz.) at Mokapu Point (near Diamond Head) and Earhart homed in on it to a successful landfall. During an attempted takeoff for Howland Island from Luke Field, near Honolulu, on March 20, 1937 the Electra ground-looped and was damaged to the extent that it was shipped back to the Lockheed plant in California for repairs. There had been no major damage to the radio gear, and the main thing done to the radio system while at Lockheed was to replace the Western Electric Model 20B radio receiver and its remote control apparatus with a Bendix Type RA-1B Aircraft Radio Receiver and its accessories,which included means for complete remote control from the cockpit. This work was done by Lockheed contract technician Joe Gurr. The RA-1B was a brand new Bendix product and was reputed to be pushing the state of the art in aircraft receiver design. It was a super heterodyne, which had the frequency range .150-1.50 and 1.80-15.0 Megahertz, which was divided into six bands: I: .150 – .315; II: .315 – .680; III: .680- 1.50; IV: 1.80 – 3.70; V – 3.70 – 7.50; VI: 7.50 – 15.0. The gap between 1.50 and 1.80 MHz was to accommodate the intermediate frequency. It could receive voice or “CW” signals, and there was a three-position antenna selector switch which permitted three choices of antenna. 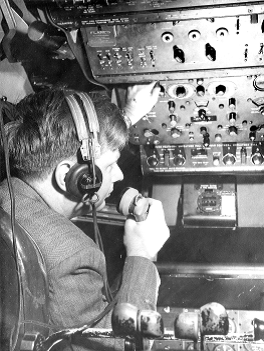 With the switch in the “DF” position, the receiver was connected to the Bendix type MN-20 rotatable loop mounted atop the fuselage over the cockpit, and the combination comprised a radio direction finder. With the switch in the “TA” position the receiver was connected to the trailing antenna, and when in the “FA” position it was connected to the fixed antenna. It should be noted that signals from the loop antenna went directly from the loop, through the antenna switch, to the input of the receiver, whereas signals from the fixed or trailing antenna passed through the “send-receive” relay in the transmitter before going through the antenna switch to the receiver input. It also should be noted that on this model receiver any radio signal within its overall frequency range could be received on the loop antenna. Because of this, some people had the impression that radio bearings could be obtained on any frequency within the receiver’s frequency range, and the unit was sometimes spoken of as a “high frequency direction finder.” The unit of course had no such high frequency direction finding capability, and in later models circuitry was introduced to limit reception on the loop antenna to only frequencies in that part of the overall range deemed suitable for radio direction finding with a loop antenna, i.e. below about 1.80 MHz. 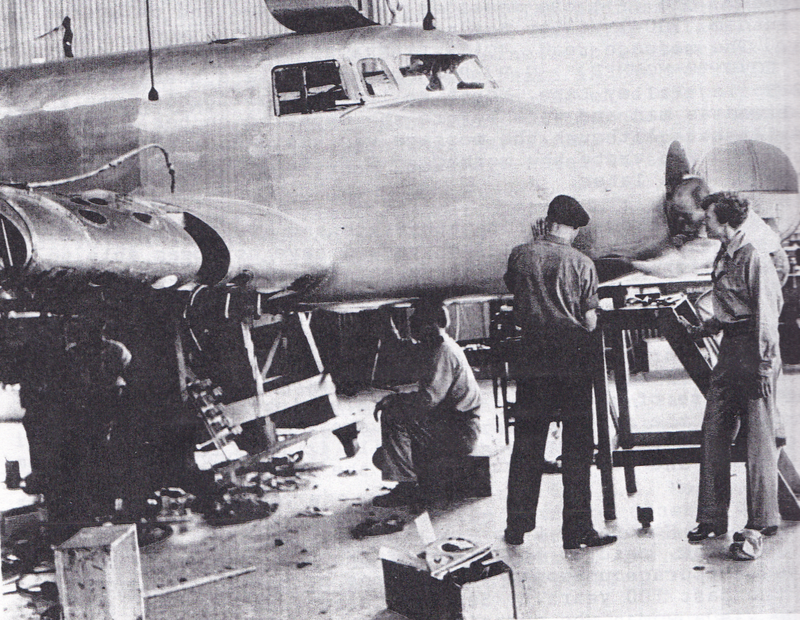 A rare photo of Amelia Earhart (right) and her Electra 10E, NR 16020 at the Lockheed repair facility in Burbank, Calif., sometime during the spring of 1937. (1) Bendix Type RA-1B Aircraft Radio Receiver. Mounted in the cabin but having remote controls in the cockpit. 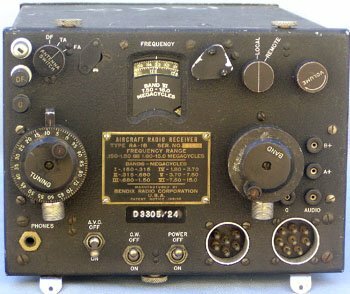 (1) Western Electric Model 13-C 50-watt Aircraft Transmitter. It had three crystal-controlled channels, 500, 3105 and 6210 kHz and could be used for voice or “CW” (radiotelegraph) transmissions. It was mounted in the cabin but there were remote controls in the cockpit. (1) Bendix Type MN-20 rotatable shielded loop antenna. It was mounted on the top of the fuselage over the cockpit, with the knob which rotated it located on the overhead of the cockpit, between the pilots. It was used primarily for taking radio bearings but was useful as a receiving antenna under conditions of heavy precipitation static noise. Provision for plugging in a microphone, headphones, and a telegraph key at each side of the cockpit. A telegraph key and provision for plugging in headphones at the navigator’s table. A 250-foot flexible wire trailing antenna on an electrically operated, remote-controlled reel, located at the rear of the plane. 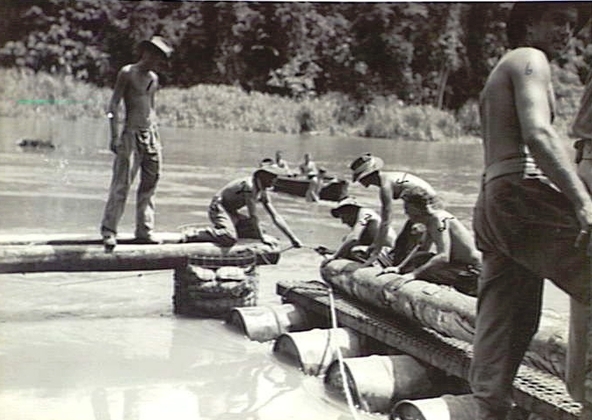 The wire passed to the outside through an insulated bushing and had a lead weight, or “fish,” at the end to keep it from whipping when deployed. There was a variable loading coil used in conjunction with this antenna to permit its use on 500 kHz. This antenna was long enough to give excellent radiation efficiency on all three of the transmitting frequencies. A fixed antenna which was a wire “Vee” with its apex at a stub mast mounted on the top of the fuselage, about over the center section of the wing, and the two legs extending back to the two vertical fins. This antenna was so short that its radiation efficiency was extremely low. It was not intended to be used on 500 kHz and probably the radiated power on the other two frequencies was very low. It was meant to be used mainly for local communications around an airport when it was not possible to have the trailing antenna deployed. According to some accounts there was a second “V” antenna mounted on the underside of the fuselage and connected in parallel with the top “V” antenna. If so, it was removed or disconnected before the plane left Miami. One of the first things she did after arriving in Miami was to have the trailing antenna and associated gear completely removed. John Ray, an Eastern Airlines technician, who had his own radio shop as a sideline, did the work. This had a devastating impact both on her ability to communicate and on her ability to use radio navigation. With only the very short fixed antenna remaining, virtually no energy could be radiated on 500 kHz. This not only precluded her contacting ships and marine shore stations, but more importantly, it prevented ships (including the ITASCA) and marine shore direction finding stations from taking radio bearings on the plane, inasmuch as 500 kHz was the only one of her frequencies within the frequency range of the marine direction finders. Thus any radio aid in locating Howland Island would have to be in the form of radio bearings taken by the plane on radio signals from the U.S. Coast Guard Cutter Itasca. The shortness of the antenna also drastically reduced the power radiated on the two high frequencies. Paul Rafford Jr., an expert in this field, estimated that the radiated power on 3105 kHz was about one-half watt. This obviously was a tremendous handicap in the high static level of the tropics. Despite the shortcomings of her radio system, Miss Earhart got as far as the Dutch East Indies without major incident. There however, through lack of understanding, she made an error which ultimately lead to her failure to reach Howland Island. 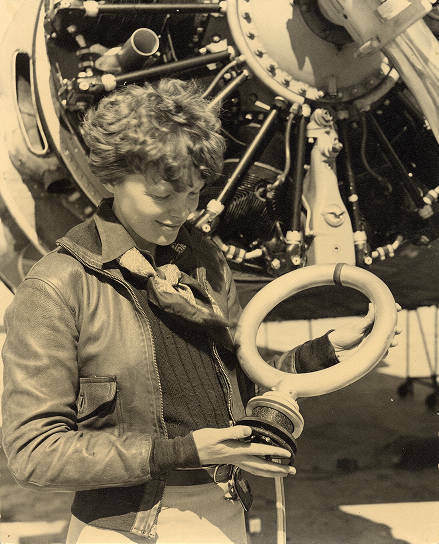 Amelia with the Bendix Type MN-20 rotatable shielded loop antenna, which was mounted on the top of the fuselage over the cockpit and apparently failed to help her in any significant ways during the final flight. Three ships had been assigned to assist Earhart on the South Pacific over-water flights. 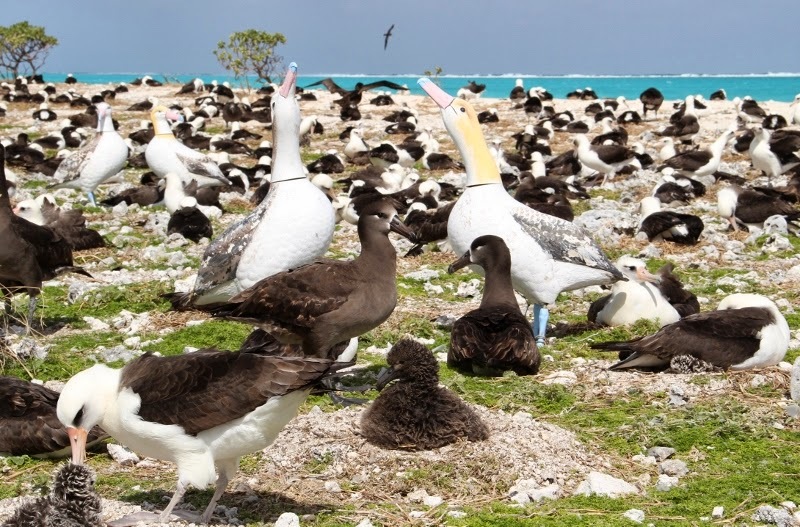 Itasca was at Howland Island, Ontario about half way between New Guinea and Howland, and Swan between Howland and Hawaii. One function of these vessels was to transmit radio signals upon which Earhart could take bearings with her radio direction finder and thus be helped with her navigation. Suitable homing signals from Itasca were extremely important, in fact vital. 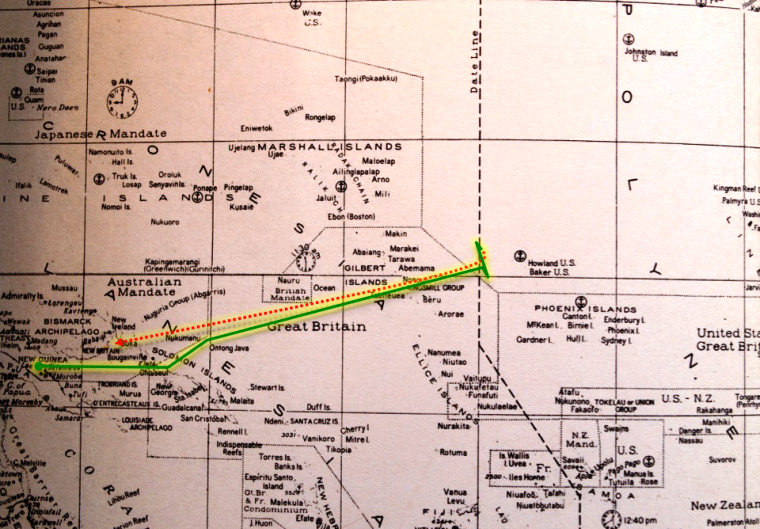 Should Noonan’s celestial navigation not hit Howland right on the nose, homing in on Itasca‘s signals with her DF was the only way Earhart could be sure of finding Howland before her fuel was exhausted. In a message dated June 23, 1937 addressed to Earhart at Darwin or Bandung, Mr. Richard Black, aboard Itasca, advised her of the radio frequencies available aboard the Ontario, Swan and Itasca, and asked her to designate the frequency she wished each ship to use to provide homing signals for her. 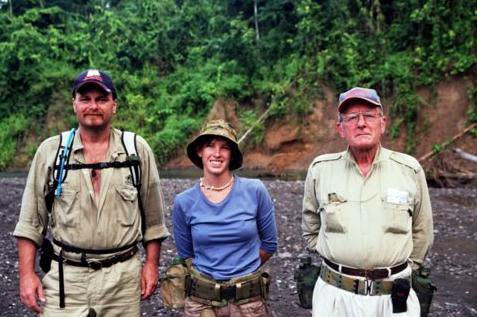 The same day the Commanding Officer of Itasca requested that he be advised twelve hours prior to her departure from New Guinea of her desires in matter of radio, and warned her of the slowness of communication via Port Darwin. No one questioned the message and Itasca tuned up its transmitter to send homing signals on 7.5 Mc. What happened after that has been well covered in the media and in numerous books. 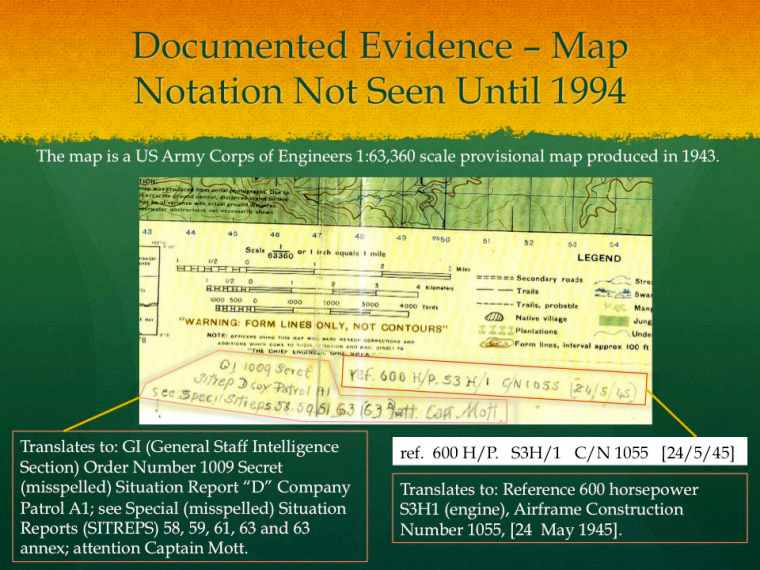 When the plane arrived at what Earhart believed to be the vicinity of Howland, no land could be found despite considerable visual searching, whereupon Earhart asked Itasca to send homing signals on 7.5 Mc, Itasca complied. Earhart heard the signals but reported to Itasca that she was “unable to get a minimum” on them. This meant she could not get a bearing on that frequency. She then asked Itasca to take bearings on her 3105 kHz. transmissions, apparently believing that the direction finder ashore on Holland Island could take bearings on that frequency just as the PAA Adcock systems had done on the earlier flight from Oakland to Honolulu. When she heard no response from Itasca (the reason she did not hear any response will be addressed elsewhere) she transmitted her line of position, said they were running north and south and that she was shifting to 6210 kHz. She was not heard again by Itasca. Apparently she commenced execution of her Emergency Plan at about that point. (a) How was the plan for the use of radio homing beacons aboard the three ships developed? (b) What was the plan? In Part II of “Amelia Earhart and Radio,” Almon Gray will continue to analyze Amelia Earhart’s radio communications during her doomed last flight. He will also attempt to explain how and why Amelia’s transmissions were so completely ineffective, or at least appeared to be.